Subaru and Toyota joined forces on a joint effort to build a rear-wheel-drive sports coupe during the previous decade, and in 2012 Subaru’s version hit the showrooms as a 2013 model and was named the BRZ. Subaru handled the lion’s share of engineering of the sports car and installed their vaunted “boxer” engine in the vehicle. The BRZ moniker denotes the boxer engine, rear-wheel-drive, and Zenith. Zenith stands not for an old television, but for “above”. I found a 2017 BRZ Limited in my driveway for testing recently, with keys slipped through the mail slot in my home. I didn’t have to insert the keys in the BRZ because the Subaru has “keyless access and start”, allowing you to enter and drive with the keys in your pocket. 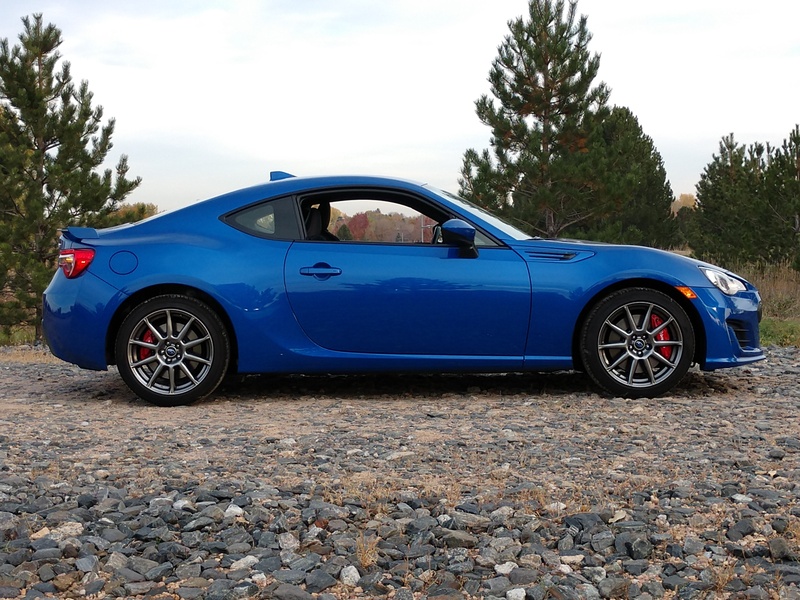 This BRZ was equipped with the 6-speed manual transmission, and I was able to handle the transmission rather easily. The BRZ is powered by a 2.0 liter, four cylinder boxer aluminum engine that provides 205 horsepower and 156 lb.-ft. of torque. The punch-counterpunch action of the boxer pistons in the Subaru cancel each other out and provide a smooth delivery of power. 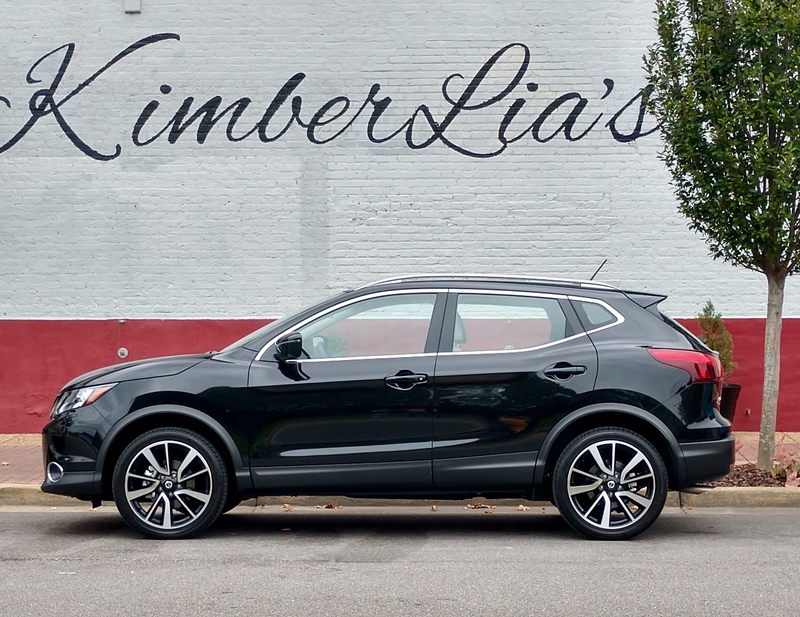 Also, the horizontally opposed engine results in a lower center of gravity in the vehicle (18”), aiding the handling and cornering characteristics. Porsche and Subaru are pretty much it when it comes to boxer automobile engines, and the design is found in some BMW and Honda motorcycles. The motor was patented by Germany’s Karl Benz in 1896. Fuel economy ratings on the BRZ are 21-city, 29-highway, the car burns premium unleaded gasoline, and the tank holds 13.2 gallons. I took a spin over to Loveland in the BRZ and took a detour north on the “Jackrabbit Trail” for some winding road driving. I’ve found that recently most folks around Greeley don’t use that name for Highway 257, but when I arrived in this area in 1979, that was what the road was called. I think it came from an early name for the Mad Russian over near Milliken. On the drive the BRZ exhibited its nature as a true sports car with 4-wheel independent suspension, and 4-wheel disc (11.5”) brakes. Reportedly the 2,800 lb. car travels from zero to 60 in 6.4 seconds. Inside, the Limited has black leather seating trim with Alcantara (suede-like) inserts to keep the occupants from sliding around, and Subaru has installed a 6.2” touch-screen navigation/infotainment system in the BRZ. 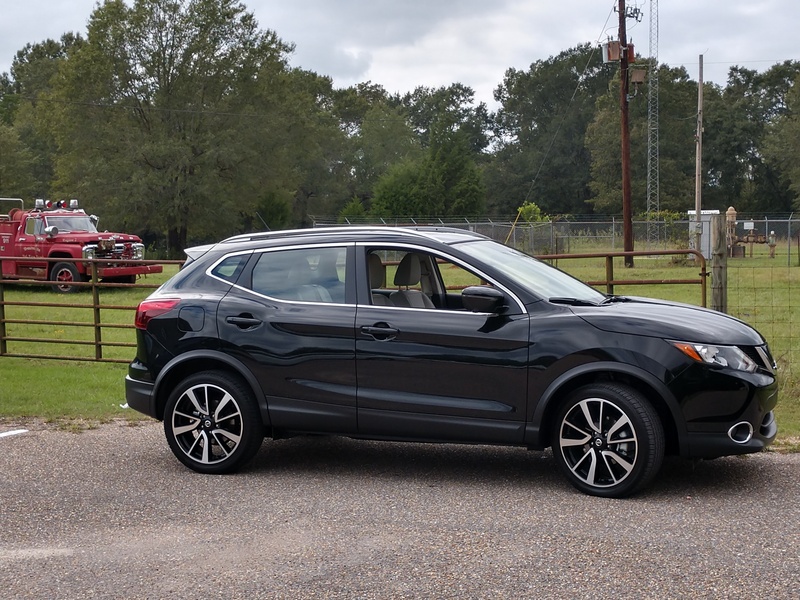 Also on hand are dual-zone air conditioning, Bluetooth capability, satellite radio, and USB/Ipod connection. Ruth and I took the BRZ to the factory outlet stores and I noticed that the shoppers were taking a good look at the Blue Pearl Metallic BRZ in the parking lot, admiring the ten-spoke dark gray alloy wheels with 215/45R17 Michelin Primacy HP summer radials, dual exhaust tips, and trunk spoiler (it’s atop a 7 cubic ft. compartment). M.S.R.P. for the Subaru was based at $27,645.00. Freight and a performance package brought the total to $29,660.00. Shoppers looking for an under-$30,000, 2 + 2 sports car with terrific styling and performance would be well-advised to look at the 2017 Subaru BRZ. 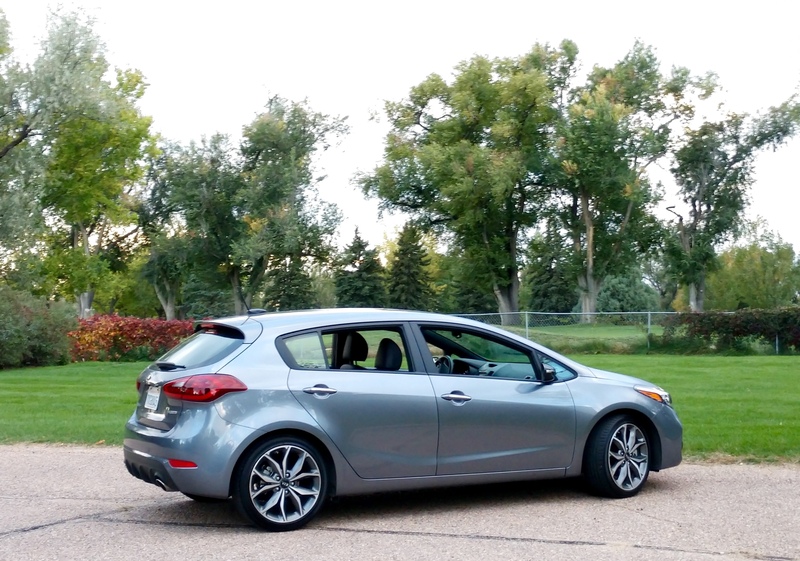 The latest car that was delivered to my house for testing was the 2017 KIA Forte5 hatchback – the Forte has been around since 2008 but had extensive updates added periodically since that time. My test car came in Phantom gray metallic paint and included black and red leather seating for five inside. As of this writing, I do not know where KIA came up with the name for this car, but wonder if they named it after the handsome Fabian, teen idol of the 50’s and 60’s. Many readers do not know that Fabian’s full name was Fabiano Anthony Forte, or that he was referred to his record producer by Frankie Avalon, another South Philadelphia resident. Eleven of Fabian’s songs reached the Billboard Hot 100 listing, including “Hound Dog Man”, “Tiger”, and “Turn Me Loose”, and he later got into movies including the part of Pretty Boy Floyd in “A Bullet for Pretty Boy” (1970). Perhaps KIA’s hatchback that I drove was not named after Fabian, but my research into the matter has ended. I will say, however, that the Forte is a “pretty boy”, as are several Hyundai and KIA vehicles since the hiring of Peter Schreyer by the corporation to head their California design studio. 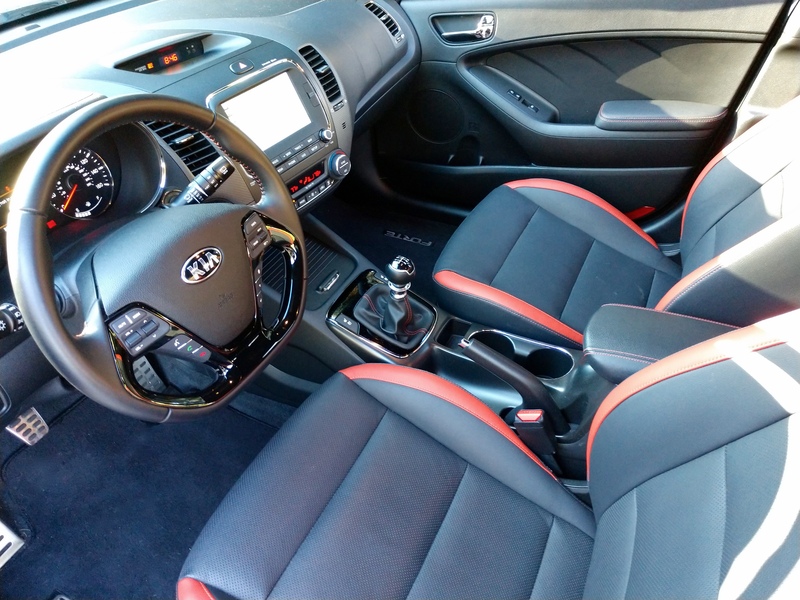 The latest KIA’s are lower, wider, and longer that those of the past, with a wheelbase of this Forte5 of 106.3” and an overall length of 171.3”. The Forte5 weighs 3,058 lbs. My test Forte carried an M.S.R.P. of $27,020.00, a figure that took me a little by surprise when I withdrew the window sticker from the glove box. Included was $125.00 for carpeted floor mats and $895.00 for freight. As standard items, the car was equipped with sun roof, power/ventilated front bucket seats, push button starter, proximity smart key, tilt/telescope steering wheel, navigation system, satellite radio, Bluetooth/USB connectivity, and power outside folding mirrors with light stripes. The KIA was powered by a 1.6 liter (201 hp/195 lb. ft.) four cylinder, turbocharged, DOHC, 16 valve engine and featured a six speed manual. Acceleration of the Forte is reportedly zero to 60 in 7.3 seconds, and fuel economy is rated 23-city and 29-highway. My observance was of 30.1 mpg during my week with the car. My wife and I drove the KIA to Denver for a visit as well as a trip from Greeley to DIA on Highway 85. Ride was suitable, guidance was fine, and wind noise was not excessive. At the airport parking lot and in Greeley I admired the Forte’s small, 34.8’ turning radius. The car fetched a lot of onlookers with the superb styling I hinted at earlier as well as the well-designed 17” alloys, which were fitted with Nexen Classe Premiere P215/45R17 m/s radials. Chrome door handles adorned the exterior of the car. KIA Forte auto sales are sizzling in the U.S. – about 70,000 sold in 2017, year-to-date – and this hatchback is a key component of that success. I can see why; it’s quite a “Tiger”.